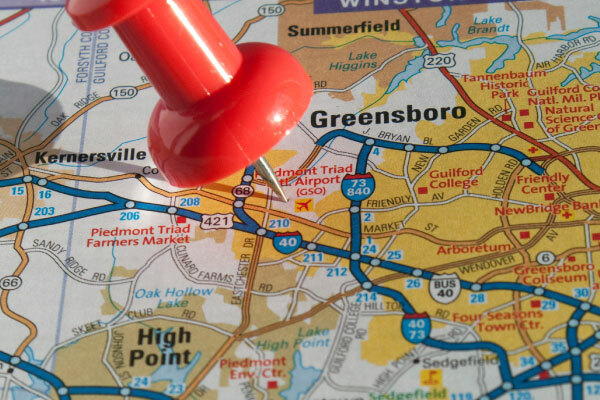 In May, the Piedmont Triad Partnership invited me to join a press tour of the area. We visited several manufacturing and distribution facilities, and Old Dominion Freight Line's headquarters, but the Piedmont Triad International Airport (PTIA) was the focal point. From my initial arrival to our final stop at the new runway and FedEx Mid-Atlantic Air Hub, conversation generally orbited around plans for an Aerotropolis. The word itself, and the vision it conveys, has an almost futuristic subtext—a "Jetsonian" utopia in my cartoon-cluttered mind. But as I learned, the concept is more grounded than that. Air freight and FedEx are the magnets that build attraction, but warehouses, trucks, and manufacturing are the bearings that will make this vision real. Liberty Hardware is proof-positive of the Piedmont allure. The cabinet hardware and decorative home furnishings supplier relocated to Winston-Salem in the 1980s to be closer to the region's established wood furniture industry. Two decades in, and despite outsourcing's grip on North Carolina furniture manufacturing, Liberty Hardware is thriving. Walking around the company's 680,000-square-foot distribution facility, I am struck by its sterility. Its floors are immaculately clean. The sheen from the overhead lights is glaring. The only pollutant is the hum of fans and the whir of automated guided vehicles and conveyors flowing product about. The DC's sorting operation has the look and feel of a baggage claim carousel—except faster and without that nagging feeling of "maybe, maybe not." Colors abound. Red stripes, green racks, and yellow columns liven up industrial grays. Yet, oddly, it is the blue shrink-wrapped pallets that capture my attention. Why blue? Because it grabs attention, visually differentiates product, and reduces claims. Liberty Hardware takes cleanliness, efficiency, and safety seriously. Housekeeping ranks right up there with on-time shipping, says Tom Turner, vice president of global logistics. Looking up at the banners hanging from the rafters—"Don't Take Chances with Safety" and "100% Complete, Accurate, On-time"—Turner's words resonate. The point is crystal clear. At a welcoming reception sponsored by the Piedmont Triad Partnership, I find myself reaching beyond the Swedish meatballs for a way to introduce myself to a collection of local transportation and logistics luminaries. As a writer, it's rare that I find myself at a loss for words. But in public it's different. After a series of fumbling handshakes and mumbled introductions, I ditch logistics and go straight for the familiar—college basketball. "So, are you a Blue Devils or a Tar Heels fan?" The reaction is immediate and charged. Quickly I learn the nuances of the Duke/UNC rivalry. Feeling confident, I go with the flow, pick up some nerve, and toss out my next question. "How do you feel about the per-mile tax that has been pitched as a revenue source for North Carolina infrastructure projects?" Apparently I know how to smother conversation as quickly as I can kindle it. Back to basics. "So, what about Davidson...where do they fall in the pantheon of Carolina basketball?"